We had a fun wine dinner at our house recently with friends (more on that later), and one of our guests, Greg Harrington from Gramercy Cellars, brought us a couple of great wines as a thank you gift. 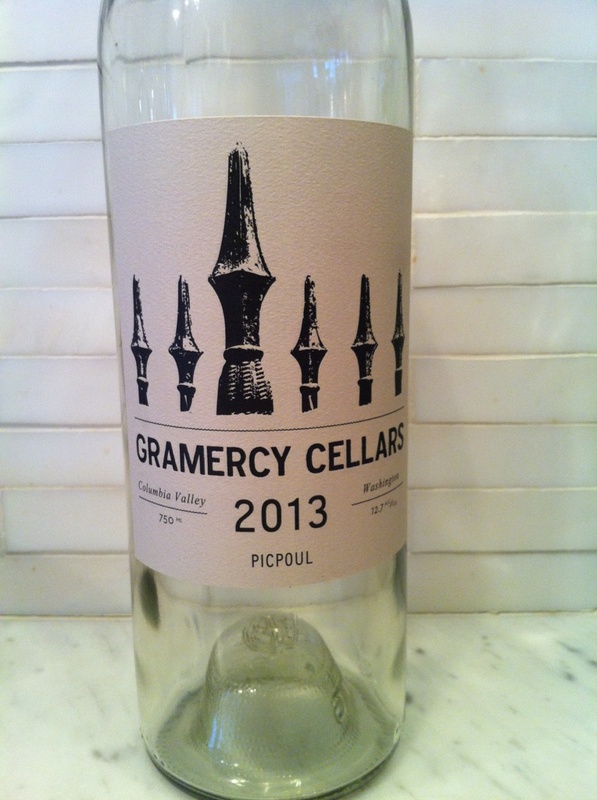 Gramercy Cellars limited release 2013 Picpoul. I don’t recall ever having a Picpoul wine before (or if I have, I didn’t know it), but I like it. This is an excellent summer white wine that reminded me of a cross between (90%) Chardonnay from Chablis and (10%) Roussanne. I asked to learn more about it, and Greg told me it was a blend of (92%) Picpoul and (8%) Viognier. Greg also mentioned that the Picpoul vines had to be removed after harvest to plant Grenache. Apparently the deal was that Leif Olsen, Gramercy’s top Grenache grower, had enthusiastically agreed to plant more Grenache for Gramercy (specifically head-trained Grenache, which is the standard for the best Grenache vineyards in the Southern Rhone), but first, Leif really wanted to see Gramercy do something with the Picpoul for a year. Greg saw it as a great trade and an opportunity to try something different, thus, the 2013 Picpoul is a one-time release. Picpoul is a blending variety found in Southern Rhone white wines. According to Greg, these vines were brought to the US by Tablas Creek in California from Chateau Beaucastel in Chateauneuf-du-Pape. In his words, it’s an “acid monster.” We definitely experienced that, and it’s also an excellent pairing with seafood – Christina happened to have made a dip using dill and salmon roe, and it was amazing to see the way the briny flavors of the roe married so well with the Picpoul. Oysters anyone? I think this wine is a very good value for the quality at $18/bottle. 2013 will be the only vintage of this wine, so get it while you can. There were 195 cases produced at 12.7% alcohol. I have to add this to my list of summer whites for this year – I’m keeping my eye out for other Picpouls to try as well. Let me know if you have a favorite!